→MarketAgent Review – Will You Get Paid? Is it Trusted? I have recently received an email invitation to join MarketAgent and complete online surveys for cash. So, I decided to sign up and see how much I could potentially earn with this survey panel. In this review, I am going to explain in detail how MarketAgent works and give you my honest opinion about it. Is it a trusted site? 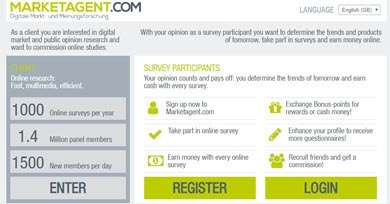 MarketAgent is a survey panel operated since 2001 by an Austrian Company called Marketagent.com online research GmbH. With 1.4 million members and over €700,000 euros in paid bonuses, MarketAgent has stood the test of time with a solid reputation. Although it has been running for such a long time, this panel is not so popular compared to Ipsos, Toluna, and i-Say, to name a few. Nevertheless, it’s another legit and decent platform you can use to complete surveys and get rewarded. By joining MarketAgent, you will get paid to share your opinions that will help companies shape the trends of tomorrow. The opportunity is currently available in many countries in Europe, South America, North America and Oceania. Get paid via PayPal and Skill. MarketAgent is also available as an app for your Android or iOS device. The minimum transfer is only 500 points. It’s available in many countries. There are not many surveys depending on your country. It can be hard to qualify depending on your profile. MarketAgent is 100% free to join, and the registration is pretty straightforward. You just have to provide some personal details such as your name, email, gender, and address. There is also an app available for your Android or iOS device so you can take surveys on the go. If you live in the US, Canada or the UK, you will earn 100 points just for signing up, which is worth $1.20 or the approximate value in your currency. In the UK, the current conversion rate is: 0.86 GBP = 100 Points. MarketAgent will send you an email invitation or push notification every time there is a new survey opportunity that matches your profile. You can also see all the available surveys in either the “Overview” or “Current Surveys” tab. In addition to surveys with a cooperated partner, there is also a Survey-Carousel (router) section with a large number of studies that are updated frequently. 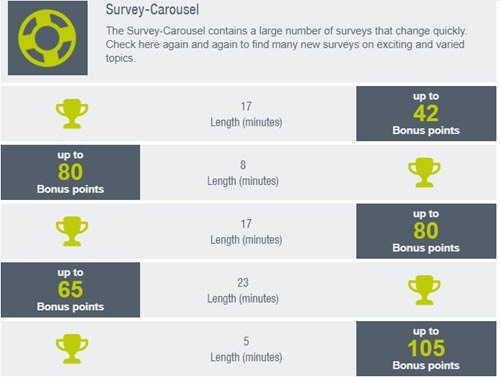 You will know how many points you will receive and the average survey length. Bear in mind that most surveys will ask a few questions to pre-screen the right candidate for a particular marketing research study. Unfortunately, you probably won’t qualify for every opportunity, and you won’t get paid for trying. It depends on your country, your profile and how many surveys you take. Some people complain about not receiving many surveys in their country. Here in the UK, I receive many opportunities daily. If you are qualified, you can expect to earn 10-250 bonus points per survey, which is less than $3. Just like many survey panels, MarketAgent pays referral commissions for inviting people to join the platform. Sending an email directly via the “invite friends” tab. Place a banner on your website (webmaster program). Although you can copy the affiliate link in the HTML code of the banner, I am not sure if you can promote that link on a social media platform. You will earn 50 points whenever someone signs up through your email or banner and completes his/her first survey. Currently, you can exchange your points for PayPal or Skill. Alternatively, you can donate to the charity of your choice, including Aides Hilf, Global 2000, Caritas, Amnesty International and Research Bee. If you choose PayPal, you can exchange a minimum of 500 points. If you decide to redeem less than 1500 points, you will have to pay a fee of 100 points. As for Skrill, the minimum transfer is also 500 points, but you won’t have to pay any fees. MarketAgent is a trusted survey panel that you can use to earn a side income online. If you play by the rules, you should get paid without any issues. Depending on your country or profile, you may get very few survey invitations, so in that case, I advise you to join other panels or GPT (get-paid-to) sites. My top-rated platform to complete not only surveys but also offers and other simple tasks is Prizerebel. Other survey and reward apps you can try are Survey App, Bituro, Curious Cat, and Poll Pay App. Now, if you dream about earning a job-replacing income online, keep reading as I am going to show you how I prefer to make money online. When I first started to complete surveys online back 2015, I had no idea about how the internet worked behind the scenes. I had no idea that a website could generate a substantial income to anyone willing to put in the work. In that same year, I discovered this excellent internet marketing program that showed me the way. I set up a website and took massive action as I was highly committed to success! After creating content for my own site during the first two years, I started making $500 per month. After another year, I reached over $1,000/mo in affiliate commissions! I am not financially free, but this extra income has given me the choice to quit my job and live life on my own terms. Look, I can’t guarantee you will reach the same results because there is no magic formula and it depends on your work ethic. Yes, it was time-consuming and hard sometimes, but in the end, it was worth it for me! I don’t regret quitting my Master’s degree to pursue internet entrepreneurship. Why? Because my WHY keeps me strong! What is your Why? Why would you like to earn a substantial income online? How could it change your life?